Constantly changing subjects and approaches enable you to re-take the workshops and always find new inspiration. All levels welcome! Refresh your creative life through painting, drawing, sculpture and design! Under the guidance of artist Tony O’Regan, learn painting techniques, how to apply perspective, sketch analysis, and composition. A great class to start or continue your artistic expression. Suitable for all levels. All supplies included. Tony’s ‘Art School’ A curriculum-based class focusing on a wealth of knowledge through detailed demonstrations and clear instruction. Build tools to heighten your artistic abilities in drawing and painting. Returning students welcome.Tony’s ‘Art School’ – Drawing: Concentrate on perspective, line, composition, tone, shade and shadow using dry and wet media. Instructor: Tony O’Regan. These courses are great for all artists and designers, but have been especially beneficial to those wishing to create portfolios for Design Schools, eg Architecture, etc. Contact Emily Carr University of Art/Design Continuing Studies to register. Use either watercolour or acrylic paints in this class taught by Tony O’Regan (www.toregan.com) where you will learn painting techniques and how to apply perspective, sketching analysis and composition. This is a great way to start or continue your artistic expression and is suitable for all levels. Learn the essentials of drawing the basic headform, and features and shading. Everything is demonstrated clearly, and supported by a website with videos. Suitable for all levels. Learn a variety of techniques to produce credible watercolors. The subjects are mainly landscapes and villages, but we are open to requests to support your interests. Everything is demonstrated clearly, and supported by a website with videos. Suitable for all levels. Tony O’Regan, artist, designer, instructor. Visit Tony’s teaching video support website at www.toregan.com. Learn from a top professional with an honors diploma in Painting, a Masters in Design (Architecture Specialization), among numerous other credits ( First Place in the 2018 ArtSlam Competition). Tony has over 25 years teaching experience at Emily Carr and UBC, and 25 years as a leading designer. Please Note: Your place in the class is confirmed by your payment of the full amount. You may withdraw with 85% refund until two weeks (14 days) prior to the first class session. After that time, No refunds or transfers are possible after one week before the first class due to our financial commitment to the instructor. Registration can be transferred to another course (depending on suitable space being available) until one week (7 days) before first class session. Missed classes are not transferable to other courses/sessions. Call 531-8226 to register. Materials lists are available at the desk. Class size is limited so please register now at The Gallery to avoid disappointment!!! Drawing Course in Morning 10 am-1 pm. A Fun Introduction to Painting in Acrylics for those who just want to jump in. We will address color, composition, and painting ‘tricks of the Trade’ . We will do an abstraction and a landscape. 10 am to 3 pm July 5 2018 . Call Shadbolt Center to register. Immerse yourself in this artistic camp and work on a variety of subjects with a focus on the west coast. Includes drawing and demonstrations concentrating on perspective, line, composition, tone, shadowing and scaling figures to context. Work on a finished painting and learn about colour theory, mixing and application. Perfect for anyone wanting to sketch and paint the landscape of B.C. (We will also talk about subjects such as villages and abstraction). Suitable for students with some art experience. You can elect to use Watercolor or Acrylic – both are demonstrated in class. Painting Monday Nights 6:30 to 9 pm at the South surrey/Semiahmoo Rec Center. Watercolor or acrylic – your choice. Part One – will focus on painting projects that emphasize colour , tonality and design. Those with painting experience may use any preferred water-based medium (watercolour or acrylics). Those with little or no experience may prefer acrylics to begin with. Part Two – will focus a little more on watercolour projects, though, if people prefer, they can continue with acrylics. We will work on paintings emphasizing form and space, through colour, light and shadow. This is “ArtSchool Friday”. Located in the new Semiahmoo visual arts studio each Friday beginning Sept 15 from 3:30-5pm. The intention is to have up to max 6 students at $50 each student per session – this includes materials AND a parent is welcome to attend for free and do the same exercises if they wish – it’s fun, but not just an after school pastime – students will learn very important basics and more advanced techniques in Watercolor. Ages approximately 6-12 (flexible) . Artist Chiao Chiao Wang will also be teaching to ensure everyone gets plenty of attention. She has a masters degree in art education. Chiao is an excellent painter in the FCA. (I have bought some of her work, myself.) We love painting and drawing and we want to pass it on!!! Just drop in to register. To Join us: Email toregan@ecuad.ca or tony@tonyoregan.com for further info. Join us while we explore either acrylic or watercolour painting. Project concepts will be taught and demonstrated in both mediums. All levels welcome! This course also includes access to Tony’s online video tutorials. To Register: Google – City of Surrey Webreg – put the numerical code 4549232 in the search box. Email toregan@ecuad.ca for materials list or further info. OR – Contact Semiahmoo Art Society to register. To RSVP: Google – City of Surrey Webreg – put the numerical code 4547790 in the search box. Email tony@tonyoregan.com for further info. OR – Contact Semiahmoo Art Society to register/RSVP. Basic through advanced participants learn the most important aspects of painting in watercolor and/or acrylic. A variety of subjects will be demonstrated and used as projects during this high energy course. The class is based on a wealth of knowledge with detailed demonstrations and clear instruction. Lessons can be reviewed on instructor’s web site for practice at home. Students will build concepts and skills to heighten their artistic abilities. Learn many essential aspects of painting – watercolor and/or acrylic. For first session bring water-medium of your choice and small sketch pad to take notes, 8 ½ x 11 or larger. Materials generally not included. In the first session other needed materials will be discussed. There is a great supply store onsite which offers very reasonably priced art supplies. 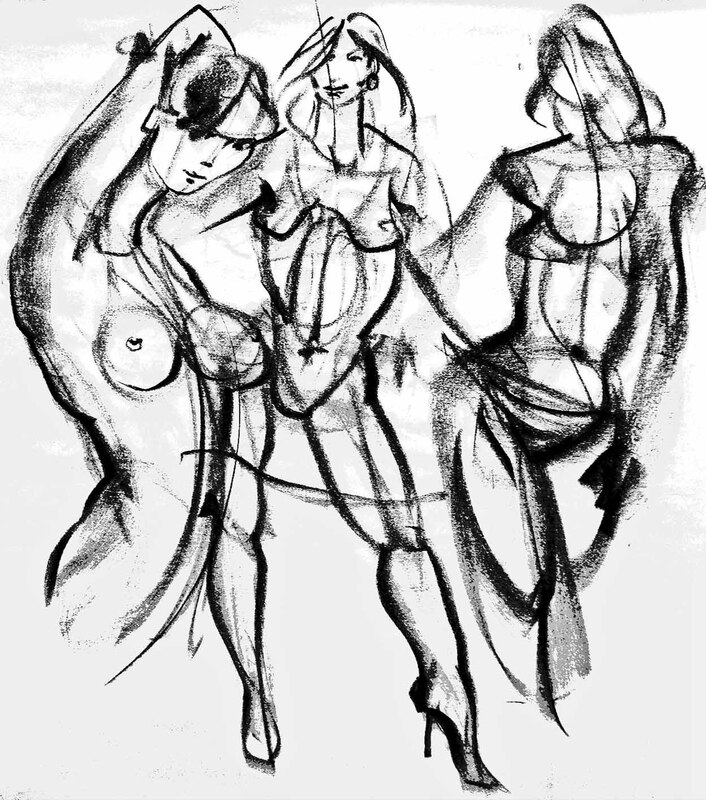 Life Drawing offers many benefits, pleasure, and FUN. Models are draped & un-draped. Bring your own sketch book and drawing materials. Everyone is welcome. Then back to Friday mornings again in September. Using charcoal and a variety of other materials, we will learn 10 Ways of Seeing and Drawing, of use for anyone who wished to draw, but also of special benefit to painters: Gesture, contour, mass, space, shading, silhouette, tonality, figure-ground, perspective, composition. A variety of subjects will be explored, villages, perspective, people in streets, landscapes, still-life. Materials not included – list will be supplied. Teens and the ‘young at art’ will learn some of the basic hands-on design studio skills for architecture. By collaborating with other students we will make a “city of the future”. Students will sketch a plan, then construct their own building using glue-gun and foamcore, and place it in a streetscape with other buildings to be photographed. With an emphasis on fun and fantasy we will create a whimsical , imaginative futuristic Metropolis (like the 1927 classic movie – google Youtube). This intensive is ideal for students looking to build a portfolio for studies in architecture, urban design, animation or set design, and many other design occupations. Instructor: Tony O’Regan, Master’s Degree Environmental Design (Architecture Specialty) and lots of other cool stuff. Contact: Shadbolt Center for the Arts, Burnaby Phone 604-291-6864. Immerse yourself in this artistic camp and produce a finished painting of scenic VENICE !. Preparation for the painting will start with two days of drawing and demonstrations concentrating on perspective, line, composition, tone, shadow and scaling figures to context. The last two days work on a finished painting and learn about colour theory, mixing and application. Perfect for anyone wanting to sketch and paint travel scenes. Suitable for students with some experience, the step-step demonstrations are backed up by on line videos for home practice. This is a “sketch model”. The purpose is to be able to build and design at the same time in a relatively quick, sculptural way, moving between sketches and modeling. You design very different things when you build a physical model during the design process vs. drawings or even computer modeling. This was done by a young student under direction in approx 12 hours, with no absolutely no prior experience. This one is fairly basic. There are much more elaborate and exploratory examples in other posts. Yes, computers are wonderful, but there is nothing like knowing some procedures for a physical model. We do a version of this model in Building Architectural Models and Maquettes at Emily Carr. Basic plan provided – exploration and creative changes encouraged. Great for adding to your design skill inventory and for Architectural portfolios. Next session is Oct 16 to Dec 11. A series of 8 Sunday afternoons, Fall 2016 (no class on holiday weekend Nov 13. Call (604)844-3800. These 4 courses have run for many years, now, at Emily Carr University (Continuing Studies-Open to all.). Numerous people have taken them to refine skills in art/design practice, to explore a career in design, and to create a number of 2d and 3d portfolio pieces for applying (many with success) to Architecture, Interior Design, Landscape Architecture and related Schools. See Portfolio category on the video-blog page. Have fun-Learn good stuff-They fill up fast! GREAT FOR PORTFOLIOS! This course is essential for artists, designers, illustrators and animators who wish to create convincing images of form, depth and space. Regardless of the form you work in, you will improve the impact of your work with an understanding of this powerful drawing technique. You will be guided through step-by-step exercises, moving from rough layout sketches to more carefully proportioned images of world architecture, vehicles and the human form. GREAT FOR PORTFOLIOS! This structured, high-energy course develops your basic to intermediate drawing and sketching skills, specifically related to space and spatial concerns. Exercises and projects focus on applying principles of perspective drawing, sketching concepts, and other compositional strategies. A variety of creative freehand techniques will allow you to develop your approach to architectural figurative drawing. Class work includes some drawing from a model. GREAT FOR PORTFOLIOS! This studio course introduces you to the design process as it applies to architecture and architectural space. Through idea generation, sketch models, proposal research and presentation and modeling techniques, you will interpret your ideas architecturally as you also explore the locational, contextual and structural aspects of architectural design. You will also work on a site-specific design project individually and in teams. GREAT FOR PORTFOLIOS! This studio course introduces you to architectural design sketch-modeling from preliminary drawings. (Several student examples pictured above). Each person modifies and adapts the basic design in their own creative direction. Through exercises and projects you will learn to read design drawings and build foam core models for architecture, interiors, landscape design or industrial design applications. We first ‘build’ a site model and then erect a lowrise & highrise model, clad and detail it, including penthouse & deck-scape. We primarily use hot gluegun and foamcore with flexible plastic for windows. This is a quick, sculptural technique often used in design schools and offices. The point of it is to use the modeling process as a design method, working back and forth between drawing and model. We design different things when we use a model. The model can be rough and ready or refined and make great portfolio photos. Also, if you learn this method BEFORE you go to design school, you get to sleep nights while others toil. June 11, 2016 caqll Emily Carr Continuing Education to register (604)844-3800) – don’t delay! These classes feature detailed demonstration and clear instruction. Lessons can be reviewed on Tony’s video website for practice at home. Students build tools to heighten their artistic abilities in Drawing and Painting AND are presented with a much coveted and bio enhancing (:-) Certificate from the Shadbolt Center. Returning students are welcome since all projects change each term. Focus on gaining design knowledge through expert demonstrations and guided exercises concentrating on perspective, line, composition, tonality and shade-light using a variety of mediums. Subjects include face, figure, still-life, landscape and abstraction. Focus on colour selection and mixing, positive and negative painting, composition/design. Basic to intermediate levels. All new projects so you can enjoy re-taking the course. Drop by The Gallery in White Rock or call (604) 531-8226 to register. This Fall the Shadbolt Center in Burnaby, BC has engaged me to offer several courses to participants who seriously want to move their art forward through painting, drawing, and sculpture, including design skills. Contact the Shadbolt Center for the Arts, Burnaby, for more info and registration. Eight Wednesday morning classes in Drawing (all media) from 10am – 12:30, beginning Oct 7 running through to Nov 25. Eight Wednesday afternoon classes in Painting (all media) from 1:30 pm – 4 pm, beginning Oct 7 running through to Nov 25. There is a reception and show of work done by a Vancouver sketch club called the Urban Sketchers – look them up on Google. Reception is 7 pm on FRi Sept 25. Runs for a week or two.